← Importing Resources from Excel into MS PROJECT 2013 and PROJECT 2016–VIDEO IS HERE! First, I created three tasks – Fixed Units, Fixed Work and Fixed Duration, Task1, Task2 and Task3 accordingly. Then I gave 5-day duration to each task and added a resource Bob to the project. I gave him a 100% of Assignments Units for each tasks (disregarding overallocation). Also Bob doesn’t work on Mondays (his calendar is modified accordingly). Well it might be confusing but this is LOGICAL! Since we put 5 days duration in a FIXED DURATION TASK TYPE, it will have 5 days no matter of Resource availability. 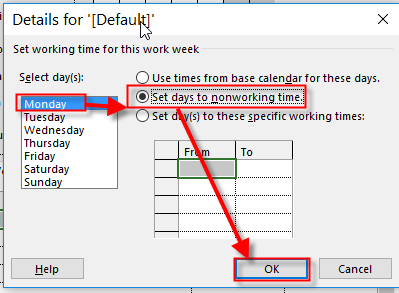 So, because Start date for the Task is 04.04.2016 (Monday), and Bob will not work at that Monday, MS PROJECT will not move this task to end at Tuesday 12.04.2016. This is an easy example. But what if we have Mary as resource and she doesn’t work at Wednesday? Does it mean that Mary will works at Monday, Tuesday, Thursday, Friday and next Monday, and Bob will work at Tuesday, Wednesday, Thursday, Friday, and next Tuesday? So the Task will start at Monday, 04.04.2016, and end at Tuesday, 12.04.2016? NO! Because in that case duration will be 7 instead of 5 days! So, no matter of Resource availability, duration remains the same! To fulfill this 40 hours Bob will work on from Tuesday 05.04.2016 till Tuesday 12.04.2016. No matter that Monday is not working day for Bob, those two Mondays are calculated in Duration, no matter that work will be 0 hours! So, Duration is 7 days! I hope that I helped with clarifying this odd situation. 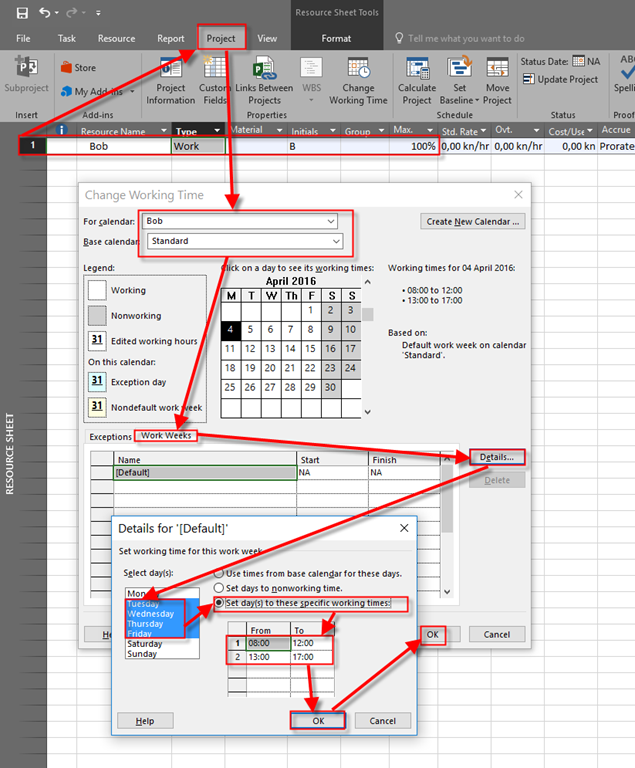 This entry was posted in MICROSOFT PROJECT, MS PROJECT 2010, MS PROJECT 2016, PMI, PRoject Management and tagged Micorosft Project 2016, Micorosft Project 2016 - Resources, Micorosft Project 2016 - Tasks. Bookmark the permalink.